Happy Halloween, “Sugar” Fix Fans! All the leaves are falling off the trees and there is crispness in the air; that can only mean one thing, it’s time for Halloween! Sugar Fix Dental Loft wants to wish the happiest of Halloweens to all of our readers. All of us here at The Loft love this time of year and all the fun things it brings. We love seeing the black, orange and purple decorations up throughout the neighborhood! Lakeview is know for it’s festivities celebrated on Southport Avenue and even the walkway located right here in front of our office at 3346 N. Paulina St. The 17th annual Halloween Walk for Kids will start at 2:00pm on Saturday, October the 29th and go until 5:00pm. Dr. Jessica Emery and her team typically love to be in the area for this walk to see all the adorable children in their costumes. 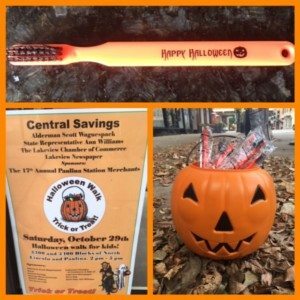 In years past, we have even handed out candy and cute children’s toothbrushes that are colored to look like a pumpkin. Speaking of candy…as your favorite Chicago dental practice, we feel it is or responsibility to remind you of the precautions to take when diving into your (or your children’s) Halloween candy. As we all know, candy is loaded with sugar. But that is not even the worst part about it. It is the sticky-ness of that candy that causes it to really stick onto your teeth. It can stay there for long periods of time, which is when bacteria can start to form. When bad bacteria is formed, it will slowly start to ear away at your enamel, causing the dreaded cavity. Now, of course, we want you to enjoy the deliciousness that is Halloween candy. So as always, use caution and always check children’s goody bags for bad candy or any other harmful products. If you do happen to bite into that Charlestown Chew and notice a filling has come out or a crown has come off, you know who to call, Sugar Fix Dental Loft! Our squad would like to wish you a safe and spooky Halloween!